At Vr = .71c, trips to the planets become routine, and mining expeditions to the Kuiper belt become practical. At .90c, trips to the outermost Kuiper belt become routine. Using both values solve the following problem. SCENARIO. For various reasons, exporting raw materials from Terra and Luna (Earth and the Moon) to space will become impractical. Using materials already in space is much more practical, and the Kuiper Belt will prove to be a plentiful source of many types of raw materials. Overall problem is for our notional spaceship to travel from Terran orbit to Kuiper Belt (KB or K-Belt), attach to an object, tow it back to Terran orbit where it will be mined, refined, manufactured and constructed into vessels suitable for use. Part-1. Determine daily %TOGW fuel consumption. For simplicity, let mo = 1 gram; then, mr = 1.42 grams. Furthermore, let's assume that our particle accelerator will smoothly, consistently consume mo throughout an entire second; thus, consider mo a rate. Next, we need to determine what size spacecraft would be accelerated by 10 m/sec by mr = 1.42/sec. DISCUSSION: "%TOGW" is an abbrev. for "Percent Take Off Gross Weight" which means amount of ship's mass that must be fuel planned to have sufficient range for the mission. 100%. If we could convert 100% of ship's mass accelerated particles (i.e., kinetic energy), then a daily %TOGW of 1% would produce a range of 100 days. Since Vr=.71c gives us a daily %TOGW of .29%, range easily exceeds this for a value of 344.8 days. For Vr=.9c, it's even better, 714.2 days. However, 100% capabilities are unlikely for human occupied vessels. 50%. Let's assume that our notional spaceship devotes half its mass to fuel. For fuel, we'll use water. Water be easily converted to plasma, field of ions, charged particles which can be moved by accelerator's magnetic fields to significant portions of light speed, c. Water has many other uses which will be discussed more fully elsewhere. (NOTE: Deuteurium molecules could filter out for use in onboard fusion reactors for onboard power requirements.) This sensible, 50 per cent restriction cuts our ranges in half. Thus, ships with particle accelerators which bring particles to .71c now can be seen to have an range = 172 days. If Vr=.9c, then range now equals 357 days. Of course, this assumes 100% efficiency in converting water to energy. Considering real life factors: design and manufacturing defects, need power for life support not to mention powering the propulsion system, need water for other things. Thus, it makes eminent good sense to assume much less then 100% effiicency. 25%. Let's assume 50% efficiency. Of course, initial ships will have much less, and hopefully design improvements will someday lead to much better efficiencies. Since we have no way of knowing which efficiencies will happen when, let's arbitrarily pick an easy number to work with; thus, 50% efficiency again cuts ranges in half. For Vr=.71c, range now equals 86 days; for Vr=.9c, range =178.5 days. Exponentials: Future sidebar will consider that fact that above analysis simplifies the fuel consumption problem by not using exponentials to model the cycle of consumed fuel decreases mass of the ship which results in less fuel required to propel decreased mass for next second and so on. Part-2. Determine required fuel for trip to Kuiper. Let Mship = 1,000 mT. 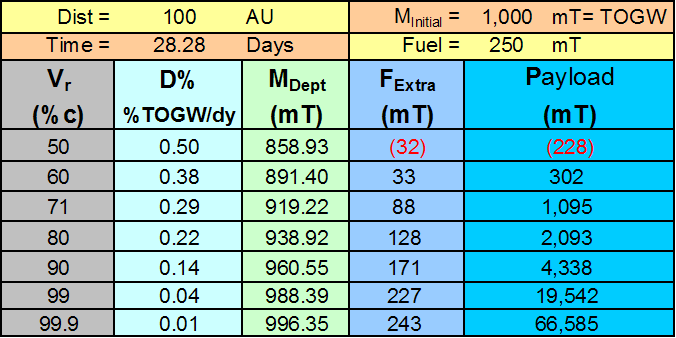 Recall that practicality and assumed efficiency = .5 gives us available fuel of 250 mT. Let distance = 100 AU =d. Decel from halfway to there, t = 14.14 days. Total travel time to there: t=28.28 days. Gross weight (GW) of ship decreases as fuel is consumed. Part-3. Determine required fuel for return trip. Recall that our spaceship will attach to a nearby asteroid and tow it back to Terra. Asteriod mass = 2,000 mT. Unfortunately, this exceeds the fuel planned 250mT; so, we'll have to downsize the payload by finding a smaller asteroid. Hopefully, 250mT will suffice for Vr=.90c. This falls far short of the fuel planned 250mT. Since space missions are so expensive, we don't want to waste any capacity so, we'll have to upsize the payload by finding a bigger asteroid. Part-4. Determine properly sized payload for return trip. Construct a table and determine a math model. Distance is an independent variable which determines most other parameters. We choose distance based on our destination. Above table uses value of 100AU, a convenient number which happens to be inside the KB. Time depends on distance. Assuming constant g-force throughout entire flight as well as flight profile where ship accelerates to midpoint then decelerates to destination, T = 2SQRT(d/g) where g = 10 m/s/s = .5 AU/d/d. TOGW is another independent variable which would be chosen to accommodate ship structure, payload and fuel. Fuel. Assume %TOGW of 25% or 250mT of Fuel. It would be prudent to carry 50% TOGW and consider half of that amount (another 25%TOGW) to be reserve. Vr, exhaust speed of particles. D%, Daily percent of ship's mass which must convert to expelled particles to maintain constant g-force. MDept. During the departure flight from Terra to KB (t=28.28 days), ship must consume Fuel (=t * D% * TOGW). This mass is deducted from TOGW to get MDept, ship's mass at end of departure trip and prior to return trip. Payload. Any fuel not needed to propel ship and crew can be used to propel payload. As a matter of fact, it would be extremely wasteful to not grab as much payload as FExtra allows. Rows are distinguished by accelerator performance. Note that Vr values start at 50% c because ships with lesser Vr would not have the range for this scenario (unless the fuel planned to use reserve fuel; in the unforgiving environment of space, I'd advise against this). Conclusion: Initial ships will definitely have Vr less then 50% can't even make it to KB, much less tow anything back. 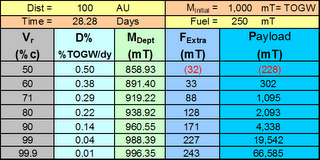 However, there are sources of raw materials much closer then KB, refer to recent Scientific Am. article which has excellent pictorial. 50% ship's mass shall be devoted to fuel. Half of this amount shall be held in reserve. Thus, 25% ship's mass can is available for propulsion purposes. This gives planners considerable margin to account for design inefficiencies and other uses for fuel substances (most likely water). Simplying this example by not using exponentials, Ship started out with 1,000mT of mass and uses accelerator with capacity to eject particles at Vr=.71c; thus, D% = .29% ship's mass per day. (where TOGW = Mship at departure from Terran orbit). To determine payload capacity, let's first determine return fuel required for ship. We have determined 93.8mT of fuel available to move payload. Since space travel is very expensive, space borne raw materials are very valuable, and we've already fuel planned considerable reserve; we need to put this extra capacity to good use.